Anchorage Park is a £6m flood protection scheme which was delivered by Mackley working as part of Team Van Oord. Portsea Island is a small, low-lying island which contains a large proportion of the city of Portsmouth. It is the third largest (by population) of any island in the British Isles after the mainlands of Great Britain and Ireland, and has the highest population density. 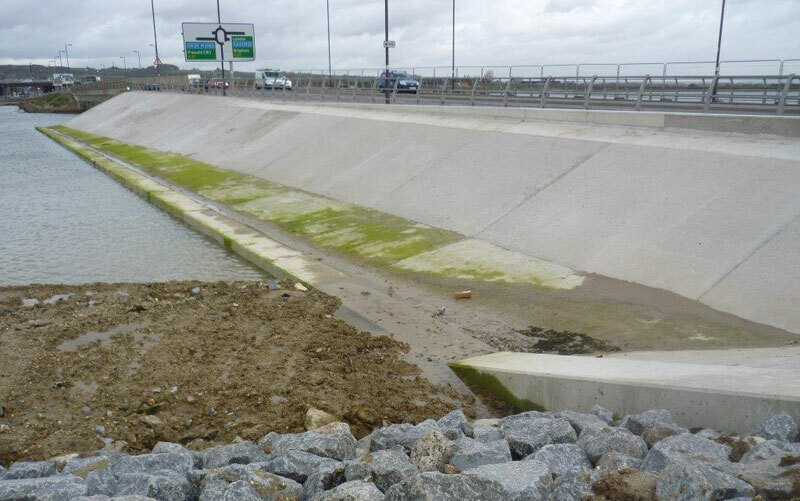 The scheme, which has reduced the risk of coastal flooding and erosion to the area over the next 100 years, was commissioned by the Eastern Solent Coastal Partnership and made possible through funding awarded to Portsmouth City Council by the EA. It involved the construction of 1.4km of coastal defences along the north of Portsea Island between Ports Creek Railway Bridge and Kendall’s Wharf. 1.4km of new embankment has been constructed using 42,000 tonnes of earth – sufficient to fill eight Olympic size swimming pools. Rocks were then placed over the top of the embankment to protect it from erosion. Imported from Norway, the rock was specially selected due to its strength, weather resistance and durability. On the eastern side of the site a wall was created from gabions (stone filled wire baskets) to support the new embankment. A new flood wall was also constructed around a bridge to reduce the risk of Eastern Road becoming a flood route. A new foundation was created for the wall by driving more than 400 steel sheet piles into the ground, and the sheet piles were also extended up and around the electricity substation in the vicinity. Construction works began in May 2015 and were substantially completed by November 2015. The scheme was praised by many local residents who attended a drop-in exhibition on 7 September, which provided an opportunity for local people to find out more about the construction work, and meet and chat to the project team. Comments on the day included a “fantastic effort”, “first class job” and “well thought out and effective”. Anchorage Park is the first stage of a wider scheme which will reduce the risk of flooding and erosion from the sea to 4,200 homes, 500 businesses and critical infrastructure, over the next 100 years. The design of the defences incorporates ideas from local residents, offered during consultation events. Once the defences are built, the area will be enhanced through an extensive replanting programme. This will increase the diversity of plants in the area, improving the current ecosystems and habitats for wildlife. Paths along the coast will be improved as part of the scheme.